The Sam on the Beach Slot is a 5 reel slot with 243 winning ways. The game is like many other slots from ELK Studios a very successful, visually excellent and with many interesting bonus features. You can play sam on the beach on all devices, including smart phones and tablets. In the middle point of the game in the beach theme is Sam and his friends Sandra, Maggie and Ted. There’s a Sam on the Beach Wild, Beach Memory Re-spins and a Free Spins feature with up to 15 free spins. There are a total of 12 bet levels starting from 20 pences per spin. Symbols and payouts: As mentioned earlier, there are the theme related symbols Sam, Maggie (Sam’s daughter), Sandra (Sam’s wife), Ted (Sam’s older brother) . These symbols also give you the best payouts in the base game. Sam himself has the best payout and if you combine 5 symbols you win 500x your bet. With maximum bet of £ 100, you can win an awesome prize here too! These symbols are supplemented only by a seahorse, a crab and a starfish. You play here with winning ways and not paylines. That means the icons just have to land side by side on your reels. Beach Memory Re-spins: You can trigger the Beach Memory feature in the base game by landing all 4 family members on your reels at the same time. Then you get a respin where Sam, Sandra, Maggie and Ted are replaced with new symbols. In total, you can repeat this feature three times, as long as all family members reappear each time. Of course, you will gain nice extra winnings with every Re-spin. Sticky Wilds with Sam – Electric Sam lands during the feature to give you sticky wilds. Bonus Multiplier with Sandra – when Sandra lands on the reels, she will increase the multiplier by 1 up to 10x. Imploding Symbols with Maggie – Maggie appears to clear away he low value symbols from the reels. Sticky Multiplier with Ted – Ted lands during the feature to give you 2x or 3x multipliers. There are a lot of very nice online casinos with ELK Studios Slots. If you just want to play for fun, you do not have to search so long, because we also offer free games from ELK Studios here. 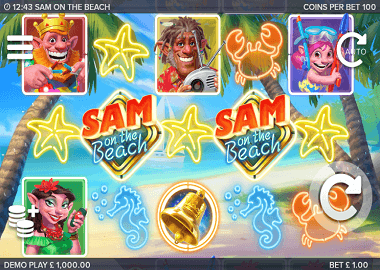 Visit this page here or play Sam on the Beach Slot by opening the game by clicking on the banner above. Recommended online casinos are the Spin Rider Casino, the Casino Luck or the brand-new Dream Vegas Casino. All providers are UK licensed and offer you very good bonus offers with Free Spins.